One of the French professional tennis players is Alize Cornet. She has won six singles and three doubles titles on the WTA Tour, as well as three singles and three doubles titles on the ITF Women's Circuit. In February 2009, she reached her best singles ranking of world No. 11. In 2007, she also won her sole Grand Slam junior singles title at the 2007 French Open. Alize Cornet is born on 22 January 1990 at Nice, France. She is born to Francis Cornet and Patricia Cornet. She has a brother named Sebastien Cornet. She belongs to French nationality. Her horoscope is Aquarius. Her ethnicity is white. Cornet’s height is 1.73 m and weight is 60 kg. Her eye color is brown and hair is of blonde. She has the balanced and healthy body. In 2005, She made her Grand Slam debut at the French Open and made it to the second round. In 2007, she was defeated in the Wimbledon 2007 qualifying event. In the US Open, she lost in the third round. In 2009, she suffered dismal in tennis season. In 2010, began her year at the ASB Classic in Auckland. In the Barcelona Ladies Open in Spain, she lost. She posted her worst result of the year at an ITF event in Marseille, France. At Wimbledon, she lost in the first round. At the Prague Open, she fell in the second round. At the US Open, she fell in the first round. She lost in the opening round at all four Grand Slam. In 2011, her first tournament was the ASB Classic. At the Fed Cup against Russia, she defeated two-time Grand Slam champions. It was nearly one of the biggest win of her career. At the Sony Ericsson Open, she fell in the first round. She lost in the first rounds of the Swedish Open and the Gastein Ladies. At the Texas Tennis Open, she was defeated. She played two ITF events, reaching the second round of one and the quarterfinals of the other. In 2012, at the ASB Classic, she lost at the first round of qualification. In the Sydney International, she was eliminated in the final round. She was then awarded a wildcard for the Open GDF Suez in Paris. She won the Bad Gastein tournament which was her second singles title. At Wimbledon, she lost in the second round. At the London Olympics, she got defeated. At the US Open, she defeated in the first round. In the following round, she lost. She reached the quarterfinals at Guangzhou. In 2013, in the Brisbane International singles tournament, she defeated in the first round. She played in the Moorilla Hobart International but was beaten in the first round. In the Australian Open, her WTA ranking climbed six places to No. 35. Her next tournament was the Open GDF Suez in Paris, France. On 24 June, she achieved a season-high ranking of No. 31. At Wimbledon, she advanced to the third round. She played in Guangzhou as the 2nd seed. She ended the year at No. 27, her highest since 2008. In 2014, she started the year ranked at 26th. She lost in the third round at the Australian Open. After Dubai, she has moved three places up the rankings to No. 23. She was dropped to the world No. 24 after the French Open. She was the top seed at the Swedish Open. At the Guangzhou International Women's Open, she was seeded 2nd. In 2015, while paying for France at the Hopman Cup. She won all three of her Group B singles matches. Later she lost in the singles quarterfinals at the WTA International tournaments in Katowice and Hong Kong. In 2016, at the Brisbane International, she was defeated in the second round. She next played in the Hobart International, where she won the singles title. In the Australian Open, she got defeated in the first round. She ended the year ranked No. 41 in the world in the singles rankings. In 2017, at the Australian Open, she was seeded No. 28. She got defeated in the second round. In the 2017 Fed Cup World Group quarterfinal, she lost the first singles match. She withdrew from the Dubai Tennis Championships because of a torn pectoral muscle. On the 22nd July 2018, she won her sixth WTA title, at Gstaad in Switzerland. On 30 August 2018, at US Open she rather than delaying the game by returning to the locker room. She quickly turned away from the television cameras and took her top off and put it back on the right way in an action that took all of 10 seconds. But as she was prepared for the match to resume, the chair umpire Christian Rask punished her by announcing the code violation for unsportsmanlike behavior due to revealing her sports bra underneath her top. As under the WTA regulations, female players are not permitted to change their attire while out on the court, but there is no such ruling in the men’s game. Alize Cornet is probably single. But it has been reported that she has been dating Gael Monfils. 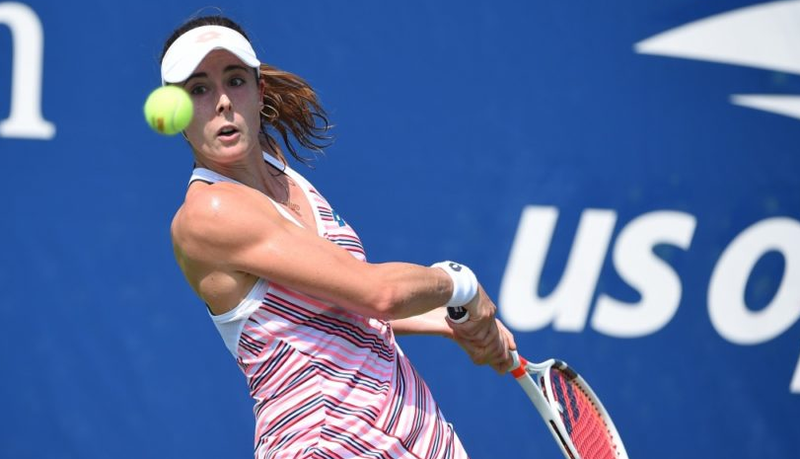 Cornet’s net worth is estimated to be $5 million.